To view silver & 18k gold jewelry click image. Gold and silver are beautiful and imperishable, and exquisite objects can be made from them. They can be shaped to any size or shapes. FastDropShip creates a combined reputation that customers will think of it whenever they want to buy silver & 18k gold jewelry. On our pages you'll find elegant works of art created by skilled craftsmen. Buy and you'll see that precious metals survive time. FastDropShip ' goal is to provide you the highest quality in silver & 18k gold jewelry; bracelets, chains, necklaces, pendants, charms, rings and much more. Jewelry is your most important fashion accessory, as it the first thing people notice about you. Fineness of gold is expressed by karat, which will tell you that the piece is real gold and the percentage of pure gold it contains. Purity of gold is measure from 1 to 24 karat. The word karat derives from the carob bean, used as a measure of weight in the ancient world. Karat indicates the amount of pure gold in the metal. If the gold content of an alloy is less than 10/24 the object cannot be represented as karat gold. Jewelry is commonly 9K to 18K. When you hear 18k gold, it means 18/24 karat which is 75% of gold and 25% alloy. More alloy or lower karat in gold, gold becomes much stronger. Because of weaknesses, gold is mixed with one or more additional metals to make it strong. Consider silver & 18k gold jewelry because they are rich in color and durable. 14 karat is 14 parts pure gold to 10 parts of other metals. 18k gold jewelry contains a higher (75%) percentage of pure gold than 14 k (58.3%). The higher the percentage of pure gold the higher the karat. Pure (100%) gold is too soft, and it is usually mixed with other metals (gold alloys) to make it stronger and more usable for jewelry. Pure gold, or 24K, has a deeply warm and rich color, but it is extremely soft and easily damaged. The higher the karatage, the richer the color will be and the more costly. Buy online silver & 18k gold jewelry for your family. 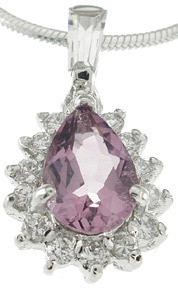 You'll find great jewelry gift ideas at http://www.fastdropship.com. Buying silver & 18k gold jewelry one can have a lot of questions: what kind of markings should on the back of jewelry? ; what is the difference between yellow, white, and pink gold? ; why is there a difference in price, in similar pieces of jewelry? ; how to care gold jewelry and so on. When buying a gold necklace or bracelet, make sure you examine the clasp to see if it is strong enough to support the chain, especially if the piece does not have a hallmark. When there's a hallmark, it means the manufacturer stands behind the accuracy of the karat mark. It is important for every educated person to have a little knowledge about the rules for buying silver & 18k gold jewelry. Information on buying jewelry will not make you an expert, but will help to be prevented from possible mistakes.